New Museum Los Gatos (NUMU) is pleased to present an exhibition of paintings by Monterey artist, Warren Chang. Voice of the Fields showcases Chang’s large scale luminous paintings of the community who labor in the farms around the Salinas Valley. Chang was born and raised in Monterey and California’s agricultural environment is part of his daily life. Influenced by the John Steinbeck tales of his youth, Warren was drawn to field workers as subjects for his recent series of paintings. 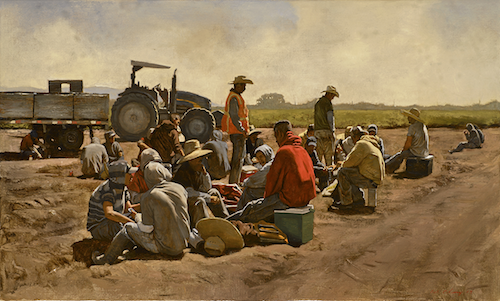 A contemporary realist whose primary focus is figurative, Warren’s striking series of paintings of farmworkers provides a revelatory glimpse into the communal experience and hard physical labor of producing our food. The lives and experiences of farmworker families often tend to be invisible, even though their labor supports some of the most productive agricultural land in the country. Chang skillfully depicts the old and young, men and women, hoeing, pruning, harvesting, at break time, and leaving the fields at day’s end. Deeply personal yet forthright, these beautifully realized paintings compel our attention and empathy to tell an important story that has been too long overlooked. Voices of the Fields will be on view in NUMU’s Spotlight Gallery from February 22 through June 16, 2019. An Opening Reception for the exhibition will be held on Saturday, February 23rd from 2-4pm.